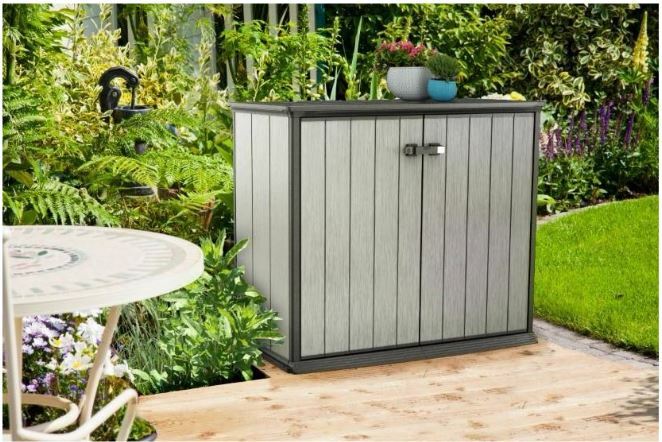 Keter’s Patio-Store regards the new-age of stylish low-maintenance resin designs represented within the outdoor patio storage cabinets range. 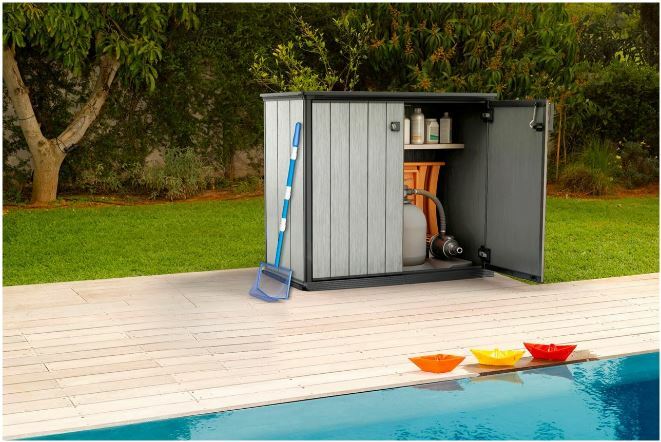 Keter’s expanding DUOTECH™ range now constitutes: Walk-In Sheds, Horizontal Sheds, High-Stores, Deck Boxes and this delectable Patio-Store. DUOTECH™ represents an innovative resin design, resistant to weather decay, boasting durability and weatherproof credentials critical to protect storage against the outdoor elements whilst displaying the gorgeous look and feel of rustic wood. This new type of manufactured facade first entered the market with Keter’s Oakland Garden Sheds. 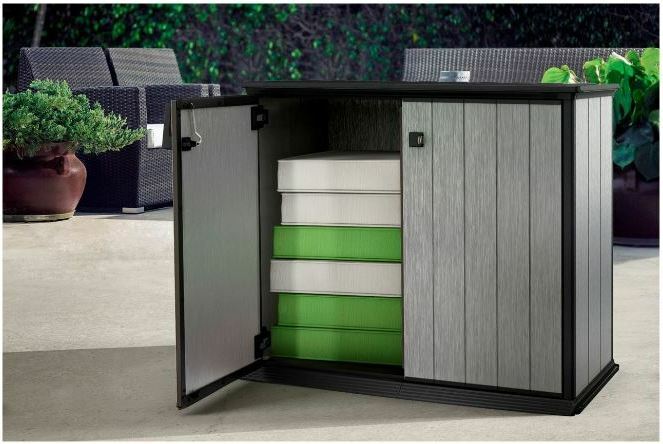 After receiving first class feedback the High-Store was born also acquiring wondrous reviews, leading Keter to expand their range across multiple outdoor storage solutions. We decided to side-step the hassles wooden storage facilities entail by moving into the quality resin style after yearly upkeep duties associated with wood rot, weather decay & yearly re-varnishing, a problem wood is prone to when subject to the outside elements, not to forget the frequent frustrations roofing felt succumbs to. Hassles now replaced with the minimalist role of a quick wash down. DUOTECH™ exhibits this patio store with a realistic weathered wooden-effect. Designed with silvery grey accents provides the rustic charm and feel of wood whilst the durability of resin lies within the makeup, resulting in a facade resistant to weather deterioration. 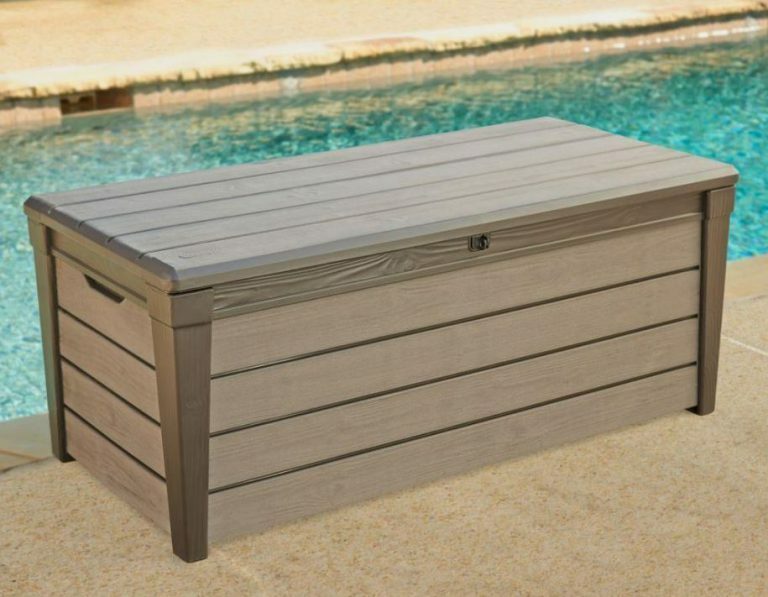 Keter’s Patio-Store offers an abundance of outdoor storage solutions from harbouring pool supplies, serving patio accessories, small gardening equipment storage, a chic addition to enhance any balcony whilst most favourably serving to store delicate outdoor seating covers & cushions. 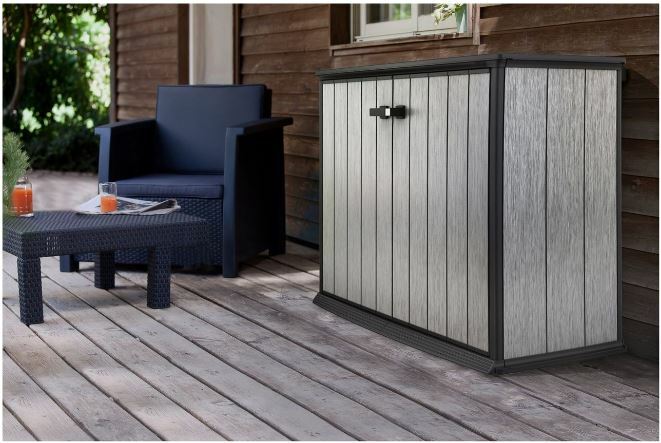 Although Patio-Store’s attraction displays a sublime silvery-grey weathered-wood appearance, DUOTECH™ design also enables decorating with a splash of colour, enhancing accents to complement any garden’s scenery due to the delivery of a paintable surface derived from Keter’s unique resin-talc formula. The composite polypropylene make-up from the roof, walls and built-in floor eliminates future conservation issues, resisting rot & decay problems whilst manufactured to prevent fading, dents appearing and peeling. A simple wash-down to restore the shine regards their only maintenance. The complete wrapping of resin provides enclosure to the outside environment thanks to the built-in floor maintaining a clean & dry interior whilst the outer weatherproof surface provides the protective coat, safeguarding against adverse weather. 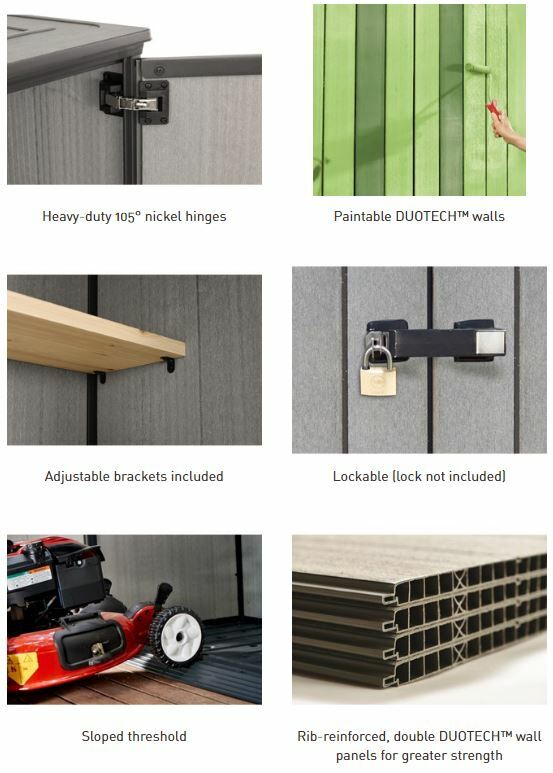 All Keter’s DUOTECH™ range are easily assembled through their tongue and groove conformation and secured with screws resulting in a robust finalised construction containing a strengthened top whilst finished with quality hardware and a floor capable of surviving demanding storage pressures. Although Keter’s Patio-Store is new to the market, reviews relating to their innovative Oakland Sheds and High-Store receive mighty fine feedback, trumpeting out robust structures, low maintenance benefits & stylish attraction. Purchasers adore the rustic charmed appearance, side stepping many competitors glossy plastic finishes whilst embracing the paintable surface now makes it possible to add a statement in the colour of your choice to brighten up any balcony or patio. DUOTECH™ is purposely designed stronger than their preceding ranges accompanying higher quality finishing touches which flows through reviews to high acclaim as does their ease of assembly regarding a tongue & groove construction process however huggins of screws are required to build Oakland sheds, not that this presents too much of problem here but there are quite a few. The walls display a silvery vertical panelled shimmer whilst up close to the touch, a feel of textured wood transpires however the beauty of maintaining the glamorous looks in minimal time lies in the resin surface, a simple wash down or wipe over with a wet cloth is all it takes to bring back assembly day’s pristine finish. Manufactured from polypropylene resin delivers an impervious weatherproof surface, each tongue and grooved section is molded into two resin sheets bound together by a corrugated reinforced internal structure intensifying their robustness. 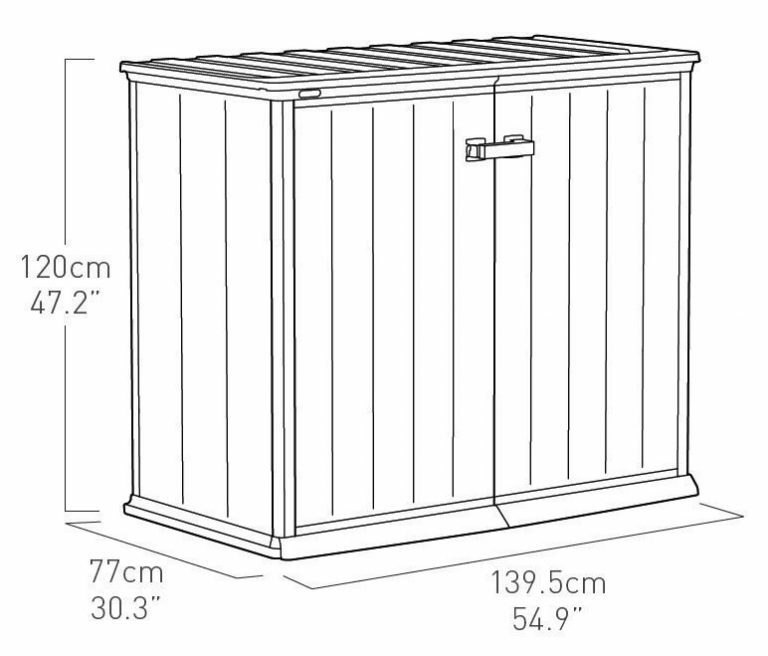 This versatile storage unit is unsusceptible to weather decay, resisting rot and rust, UV stabilised prevents bleaching and cracking when subject to sunburn attack whilst due to the sturdy make-up of the dual walled skin, the resistance to denting prevents that unattractive appearance developing, an issue thin skinned opposition & flimsy metal constructions are prone to. DUOTECH™ delivers a paintable surface, a first for an outdoor resin composition allowing customising in your chosen colour to enhance any outdoor’s surroundings in your personal style. The types of paints recommended are: Exterior water-based acrylic paint either in a Solid, Light-Shade, Satin or Semi-Gloss finish however like any paintable surface, after a while this will probably require re-painting due to weather-fade, albeit without decay issues to deal with. The resin top benefits structurally being one complete impermeable piece of double lined resin. Extending beyond the facade escapes the occurrence of water seeping in at the top of the walls providing a barrier against rainfall, resulting in maintaining a dry internal environment. Once the shed is constructed the top assures stability offering supplementary storage space. Items can be placed on top or a feature can be created: For example, planters displayed across the top accentuate additional enhancements to suit surroundings. The floor adjoins the walls creating a true built-in feature providing enclosure to the outer environment resulting in a clean internal space enhancing storage preservation qualities. 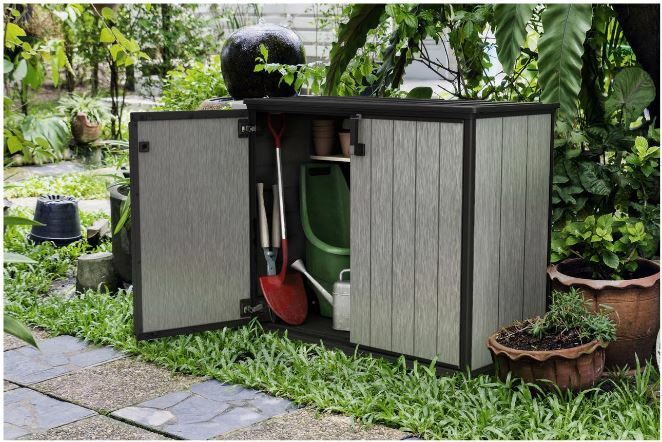 Patio-Store’s built-in floor regards a manufacture of polypropylene, molded into a thickset bed purposely strengthened to cope with storing weighty items whilst a sloped threshold enables the easy rolling-in of a small lawnmower and other wheeling equipment. 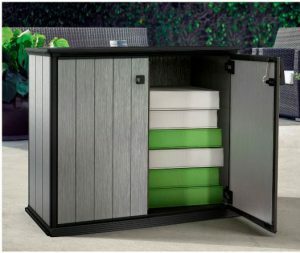 Inside the unit caters for a whole host of storage potential, whether ideas are to harbor gardening equipment, lawn supplies, serve patio accessories or an idyllic pool supplies storage unit, Patio-Store delivers. Due to Keter’s impervious wrapping however, placing more delicate items inside like seating cushions provides the popular solution to what this cabinet caters for. Internal measurements equate to 1000 L / 35 cu. ft capacity. For example: Two small 120 L / 32 gal. wheelie trash bins will fit in. 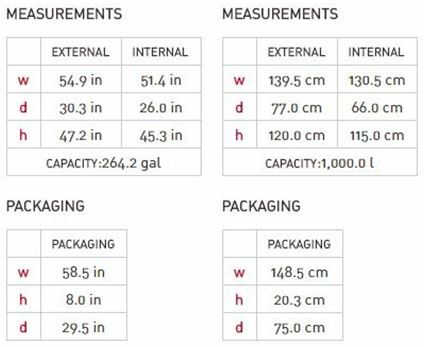 Check the internal measurements below for your storage purposes. Shelf supports with adjustable brackets are included for fitting your own wood shelf. Measurements are detailed within the instructions for cutting a straightforward rectangular plywood shelf enabling quick installation, fitting across the width of the Patio-Store on shelf supports. Facilitating the operation of the doors regard quality nickel hinges, a sturdy handle and stainless steel locking system whilst a clasp designed for a padlock enables locking both doors simultaneously. Padlock not included. Keeping the pristine finish regards the most basic of operations. An effortless wash down with warm water containing washing-up liquid usually suffices by using a soft brush or cloth. Many just lightly spray them down. Any ingrained dirt usually comes away with mild detergent however now and again we add white vinegar into warm soapy water to remove any stubborn marks. Works great for us. No rust or rot is associated with this type of resin manufacture therefore weather decay isn’t an issue. If wishes are to refrain from panting then only a wash down is required without involving re-coats of varnish, paint or wood preserve. 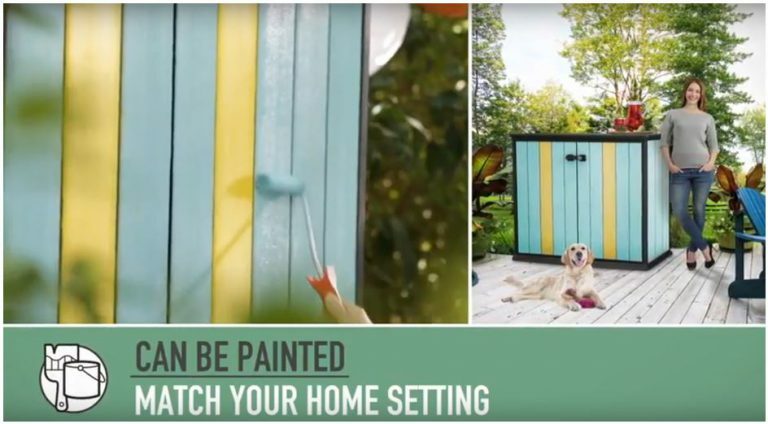 If you decide to brighten up your patio by adding a splash of colour however, over time the colour may fade requiring future re-coats yet without the hassles of rot to deal with. The Patio-Store arrives flat-packed requiring construction however it’s a very straightforward two person assembly following the order of demonstrated steps illustrated in the instructions. There are a lot of screws yet something’s gotta hold this store together to accomplish stability however it builds into a sturdy attractive patio unit upon completion. Like any resin based storage facility it’s advisable to situate on solid level ground just like a patio or balcony provide. Anchor position are embedded with the resin floor if you prefer to anchor the unit down onto the foundations below. You do require the correct anchor bolts, conditional to the base material. 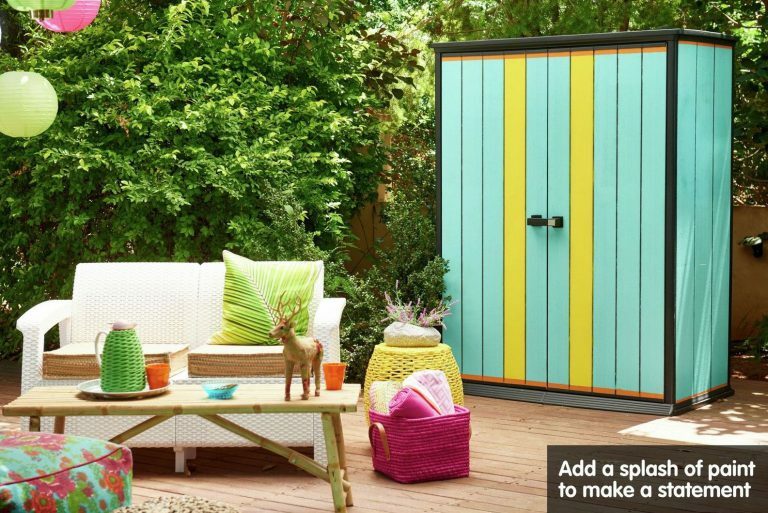 This Patio-Store is new to the market however it’s part of the hugely successful Oakland range of sheds receiving outstanding feedback, now termed as the DUOTECH™ Range where various styles and sizes of outdoor storage solutions in this design are increasing the range and attracting attention. Ultra stylish rustic charm removes any notion of a plastic manufacture, paintable if you prefer customising, resistant to weather decay, rust and rot whilst the surface is effortless to clean & maintain it’s fashionable display. It’s going to become another Keter Global Best Seller. 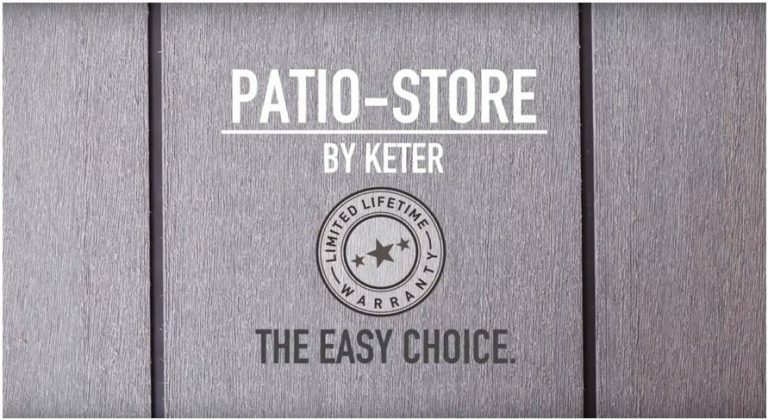 Thanks for reading about the Keter Patio-Store. Any patio-store related queries? Please drop them in the comment section below. Always happy to help. Please share with your social friends. Thank you! Thanks for this in-depth and thorough presentation, explanation and evaluation of quality plastic sheds, Simon. As a retired carpenter and avid woodworker hobbyist, I wasn’t initially all that enamored with the idea of a “plastic” shed. 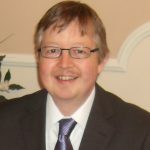 However, reading up on them, in such detail, with a bottom line of Pros and Cons that clearly favored in the Pros column, I became convinced that a quality plastic storage shed in my back yard would be a worthy addition. I WOULD, however, paint it, so my woodworking buddies who come over for a BBQ and beer get together don’t chide me for not building one out of wood myself, lol. 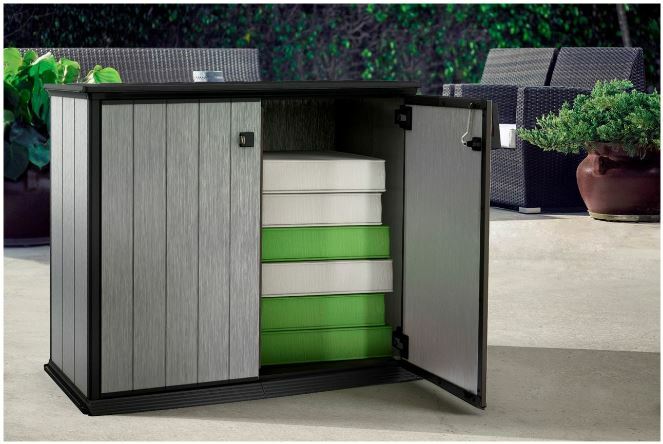 Thanks for dropping by to read about Keter’s patio storage cabinets. Don’t get me wrong Marvin, if pressure treated quality cedar wood was comparable in price we’d probably never have seen resin sheds entering the market as their superior low maintenance qualities in comparison to other woods wouldn’t warrant their development however comparing the prices, cedar wood is very expensive. I too wasn’t over enamoured with the early days of the plastic varieties of sheds and storage facilities but we went through a nightmare with decay issues, replacements of deteriorating roofing felt and re-varnishing projects throughout the last years of our previous wooden hut. We looked around for an alternative to escape the upkeep work and noticed some mighty fine stylish designs being developed. These Duotech designs are paintable so they can disguise whilst brighten up surroundings with the added benefit of just a quick clean down before future re-coats rather than having to deal with rotting issues. Hey, your mates may never twig it’s a resin structure when painted – ha! Oh, boy….another great idea for me! 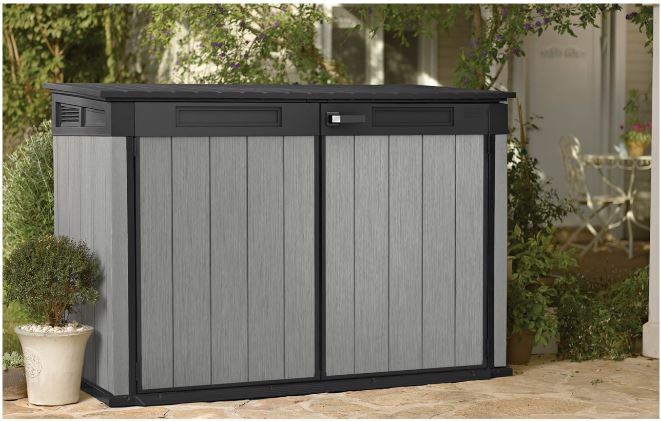 I could see this on my patio, with everything in it I need for outdoor entertaining. What a fantastic idea! I love the size and the color, and it almost looks like a nice piece of outdoor furniture to me. I like the idea that I can paint it any color I like. 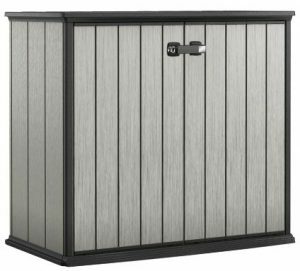 The outside of my house is grey, so I think I would go with a totally different color to make it more of an accent piece. Thanks for dropping by and leaving your comment. This is a new cabinet design from Keter. Based on their new innovative DUOTECH design which allows you to add a splash of colour to brighten up any patio and doesn’t the photo present you with ideas what could be achieved. Yeah Keter really are stepping up the game where resin designs are concerned. They have got rid of any notion of a glossy plastic look and replaced with pure style. 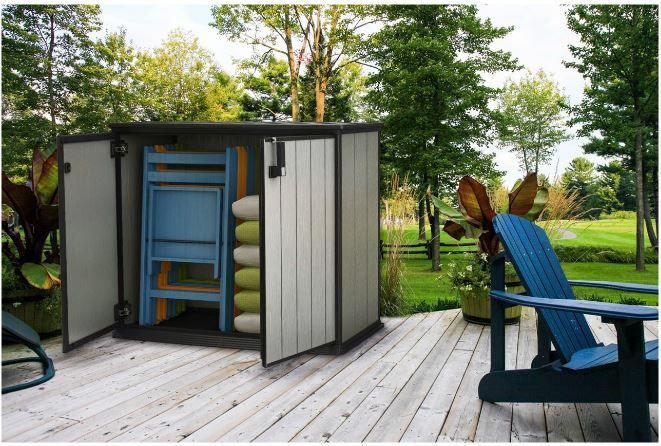 This is based on their Oakland design sheds, wondrous remarks have flooded reviews last year, leading them to develope this DUOTECH trademark following on with introducing quite a few outdoor storage solutions based on this type of manufacture. Future’s looking very bright for DUOTECH.